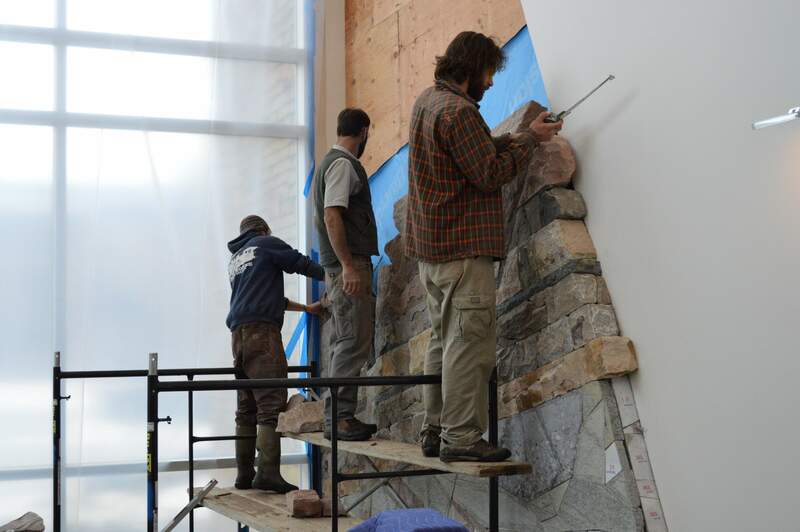 Masons from Canyon Landscape – from left, Walker Rodham, Erik Lewis and Van Lancaster – build the Geologic Wall of Time in the new Geosciences, Physics and Engineering Hall at Fort Lewis College. The wall uses local rock to depict the layers of Durango outcrops ranging in age from 1.4 billion years to 16 million years. 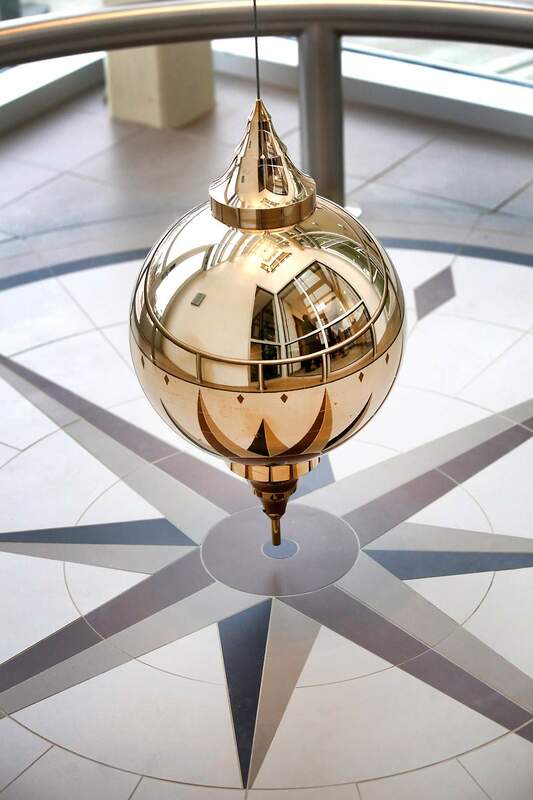 The Foucault pendulum, installed near one of the main entrances to the new Geosciences, Physics and Engineering Hall at Fort Lewis College, shows the rotation of the Earth, although it appears that the pendulum is moving. The pendulum was sponsored by Grace Deltscheff on behalf of herself and her late husband, Gustav Deltscheff. 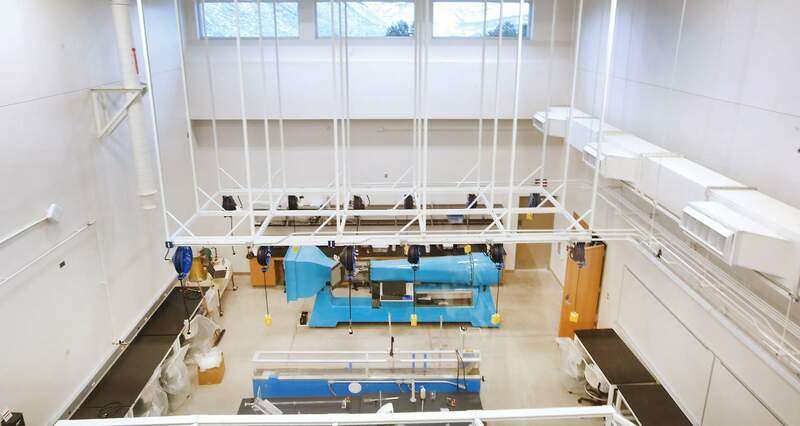 A bird’s-eye view of the Fluids Laboratory in the new Geosciences, Physics and Engineering Hall at Fort Lewis College shows the wind tunnel, rear, and a water flume, with clear piping so students can perform pressure experiments. Other labs will allow students to study optics, river morphology and geology, and paleontology. The Constellation Sky, located at one of the main entrances to the new Geosciences, Physics and Engineering Hall at Fort Lewis College, features six major constellations – the Big and Little Dippers, Orion, the Pleiades, Scorpio and Cassiopeia. They are also significant in the belief systems and lore of regional Native American tribes. A monitor nearby will tell visitors about Native American lore as well as offering a look at what’s happening in real time in the building’s labs. After $35.3 million and 10 years of planning, lobbying the state and construction, Fort Lewis College students will finally be able to pursue learning in the state-of-the art Geosciences, Physics and Engineering Hall when school resumes Jan. 9. The quality of the education is expected to go up as the new building goes online. Workers are putting on finishing touches, the Air Force is building the telescope for the domed observatory, and professors are awaiting arrival of office furniture, but the shiny hallways and classrooms will bustle when the second semester starts. Two smart classrooms have portable whiteboards, one with a whiteboard circling much of the perimeter, and students will be able to plug in devices – such as laptops and tablets – and transmit their calculations to screens. While Fort Lewis isn’t a research university, professors make a point of including students in research, and faculty-student research labs in all the related disciplines will allow more hands-on learning. The fluids lab, the first ready to go, includes a wind tunnel, water flume and the ability to do pressure experiments. Attention to detail is obvious everywhere. An aesthetic touchOther features in the hall include student study nooks, a break room and specimen storage areas. And, here and there, by the entrances and along hallways, pieces of art, mineral and fossil specimens and historical scientific instruments such as a Foucault pendulum and a sundial provide an aesthetic theme connected to the building’s mission. The Constellation Ceiling features the Big and Little Dippers, Orion, the Pleiades, Scorpio and Cassiopeia. Courtesy of FLC alumni, it was purposely designed to portray night skies that reflect the traditions and beliefs of area Native American tribes. A nearby monitor will explain the lore as well as give visitors a bird’s-eye view of what’s happening in the different labs in the building. Most of the art has a purpose, Gianniny said. “It’s to display the great connect between geosciences and physics, melding the study of our Earth in the context of the universe,” he said. What’s in a name?While the state paid for most of the building, FLC’s Office of Advancement committed to raising $4.2 million. It has raised about $2.3 million. A group of current and former geology professors and alumni are collecting $15,000 to sponsor a rock specimen display cabinet in honor of Frank. O. Bowman Jr., who founded the geology department. Alumni Charles Baltzer and Peter M. Mesard will have spaces named after them, while a gift from La Plata Electric Association sponsored a gathering area, a dashboard display where students can monitor the building’s energy production from solar panels and to cover the costs entailed with the application to make the hall Gold Leadership in Energy and Environmental Design-certified. P.J. and Tish Barney, a retired geologist and geochemist, respectively, wanted to sponsor a hands-on learning tool, and the result is a river table. Major Gift Officer Dave Kerns helped the Barneys select the river table as their gift. He went one step further and drove a truck to Boulder to pick it up and bring it back to the college. A number of naming opportunities remain, where anything from the domed observatory ($1 million) to an igneous rock slab ($2,500) can carry the donor’s name with the appropriately sized gift. “I think it will be a lot easier to raise the rest now that donors can actually see the building,” said Mark Jastorff, vice president for advancement. Final stage“This is the final stage of our STEM (science, technology, engineering and math) complex, and at 59,000 square feet, it’s the largest building on campus,” Lyon said. In addition to the GPE Hall, the college also built a new Chemistry Hall in 2001 for about $9.4 million and a new Biology Hall in 2010 for about $17.2 million. All told, in 2016 dollars, FLC and the state have invested almost $67 million in STEM facilities. The investment is expected to draw students pursuing the fastest growing majors on campus. STEM majors have averaged an increase of about 10 percent annually for several years. The Fort Lewis College Department of Advancement continues to raise money for the Geosciences, Physics and Engineering Hall. Several naming opportunities remain, including the domed observatory and the main lecture hall. To learn more, call 759-9632. The grand opening for the hall is scheduled for April 7, when attendees can comfortably visit the observatory deck and see outside features such as public art and the sundial.